When life happens, blogging doesn't. Honestly though, a month off from the blog does not mean I abandoned the hobby. So while I was a bit busier with job and family commitments, I have painted a few units and almost finished a fairly massive terrain piece that I will post later this week. In gaming, I played some SAGA and Song of Blades and Heroes, and ordered the Hail Caesar rule book when I caught it on sale on Amazon for 34% off. 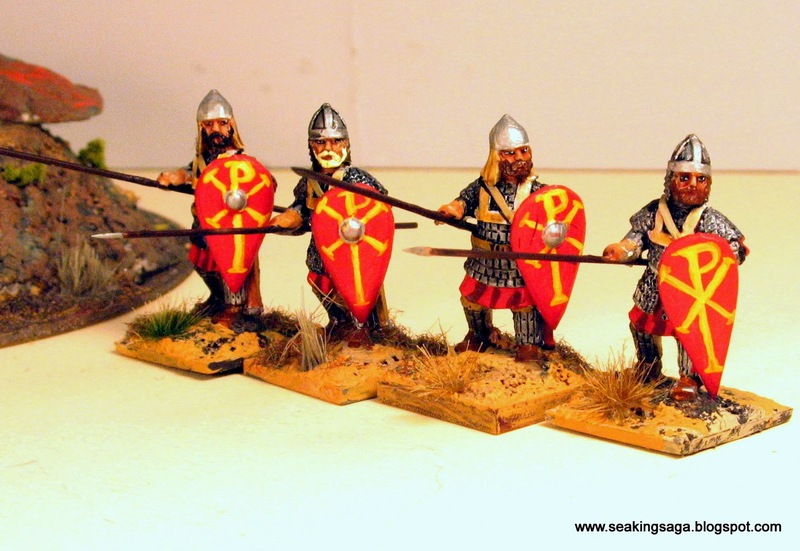 In the meantime, I am trying to build up a couple of my skirmish armies into the sizes necessary for more massive battles, starting with the Byzantines and Normans. Below, are Crusader Miniatures' Byzantine Kataphractoi with spears and maces. The troops are nicely posed and detailed, but my one critique is that the armored horses had far more flash on the rear legs than on Crusader's other horses. Whether I got a bad batch, or if its typical of the bulkier barded horses, I cannot say. 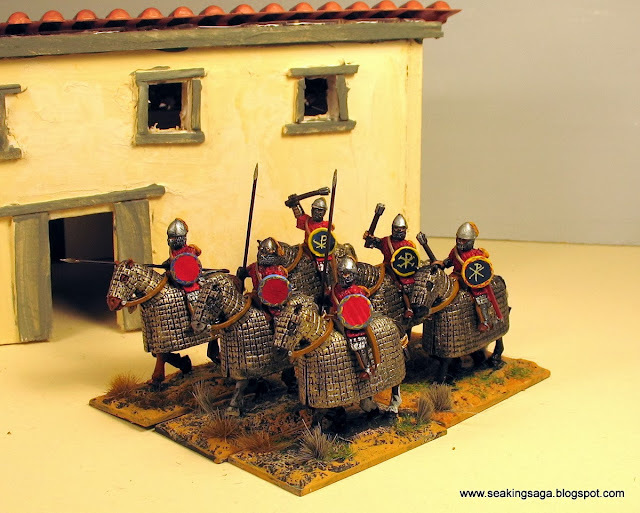 Next, are some shots of armored skutatoi and archers. The variations on leather and chainmail armor kept the painting process interesting, while still maintaining visual cohesion. 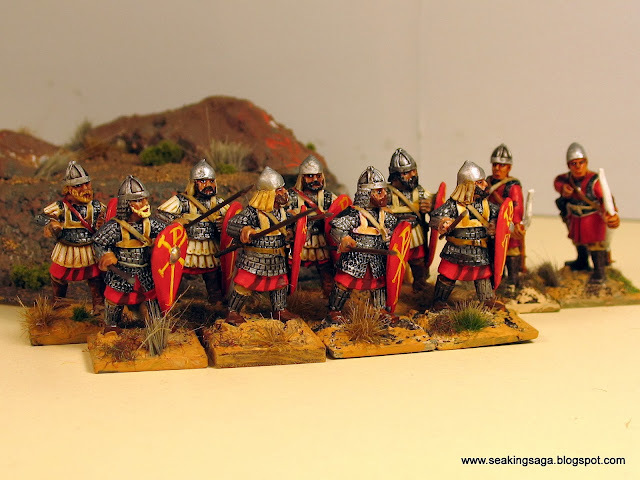 Admittedly, Byzantines are a bit of a challenge, as I am more accustomed to painting generic Dark Age Vikings, Saxons and Normans. Someone coming at them from a Roman Imperial direction would find it standard practice. I found Strategos: Born in the Borderlands and Rise of the Golden Heart by Gordon Doherty through a Goodreads group. The two released books of a trilogy tell the story of Apion, an orphaned Byzantine raised by a Seljuk farmer in eleventh century Anatolia. From a childhood in slavery, he rises to a commander in the Byzantine army in the years leading up to the Battle of Manzikert. Doherty writes compelling battle scenes and builds the air of conspiracy and danger that gave the alternate meaning to the word Byzantine. On equipment and tactics, the novels are well researched, but he makes some assumptions about the organization and activity of Byzantine thematic armies that I have not read elsewhere. It is nothing disruptive to the plot, but it did pull me out of the narrative occasionally as I wondered if it was history or invention. He also admittedly invents the shadowy enemy pursued by the main character, but it is based on an earlier Roman imperial practice. Both books are available on Kindle. Good Work, will check out this series of books as i am also painting up some Byzantines and some supporting fiction would be great! Just finished Strategos: Born in the Borderlands, cracking read cheers for highlighting it! Thanks as well. I think the second book is just as good, also. Byzantine historical fiction is not as common as Viking or Anglo-Saxon. Anybody know of anything else? 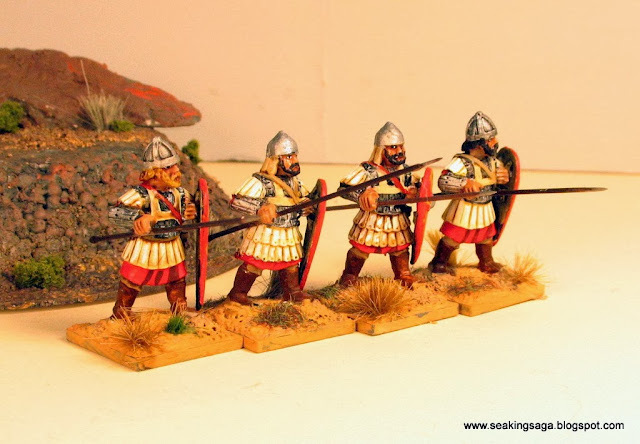 Beautiful paintwork, these figures are really great!